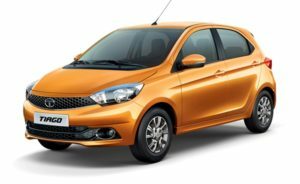 Tata Motors has designed the Tiago with utmost diligence and have kept in mind that it is distinctly different than the Indica, but has even retained the essence and utility. It is not too sane (like the Indica was) nor too curvy (something like the Hyundai Eon is). In fact, it is the right mix of simpleness and boldness and this is where the Impact design language comes into the picture. Right from the time the Tata Tiago images have surfaced (much before the launch), there has been a great anticipation with the hatch. It has a wide mesh grille in the front section that flows into the swept back headlamps on either side. The lip spoiler holds the circular-shaped fog lamps. The side section of the car gets body-coloured door handles and ORVMs with turn indicators installed on them. There are a couple of defining character lines on both the sides, with one of them passing across through the door handles. The car rides on 13-inch alloy wheels. The rear portion is modern and houses wraparound but small tail light clusters and roof spoiler. The registration number plate is attached to the lower bumper and not at the tailgate. A total of six colour options are available. But out of all the Tata Tiago colours, the Peppy Orange may be the best. The interiors seem to be the biggest surprise Tata has given. The cabin is not only well finished but nicely designed and spacious as well. This makes us think that Tata has really upped the game in the small hatchback class. Right from seat fabric options to the knitted roof lining, everything has been a well thought processed. The dashboard features a soft touch dual tone theme and with uniquely textured interiors and gloss black center console lends the car an upmarket feel. In terms of feature list and equipment level, yes, Tata has given a lot in this car. The top models feature Bluetooth enabled Harman infotainment system with a USB and Aux-In slot. The music system is powered by 8-speakers and the output is amazing. And despite not a touchscreen high tech infotainment, Tata has added a wonderful feature ‘MapMyIndia’ app for displaying visuals and streaming navigation data right on the infotainment screen. The car also gets four parking sensors. The two-pod instrument cluster with a crisp display is draped in simple brushed silver colour. The multi-information display gives info on trip distance, average fuel consumption, time and distance to empty. The center console features a pair of AC vents, music system and controls for AC. Another wonderful addition is the Juke Car App which allows simultaneous connection to 10 smartphones via WiFi hotspot. The car beside featuring a cooled glove box has a lot of storage space including 22 cubbyholes, space near the gear lever and pockets on all 4-doors. Other features include keyless entry, height adjustable driver’s seat, EPAS system and heater. Overall, this car has the right amount of features one can expect at this price point. The indigenously made engines are tuned to return maximum fuel efficiency at minimum fuel consumption. And the figures are impressive with the petrol and diesel engine delivering ARAI certified mileage of 23.84 kmpl and 27.28 kmpl respectively.Tata Tiago is an extremely fuel efficient car, which is a big bonus for the buyers. The petrol version of the cars offers a mileage of 19.22 km/litre in the city. The Revotorq (diesel) engine version offer 23.28 km/litre mileage in the city, which can go up to 27 km/litre on the highway. The suspension setup in the car does its work silently without any complaints. The car is equipped with independent suspension up front and semi-independent at the rear which takes the passengers on bad roads and highways with utmost confidence. The steering wheel of the car is also light which translates into peppy and agile driving experience.Tata’s cars are known for their absorbent ride quality and Tiago is no exception. The hatch glides over bad roads and smartly dismisses small potholes with a little thud without unsettling car’s composure. The car comes with ventilated disc brakes at the front and drum brakes at the rear. In addition it also has safety features like ABS, EBD, corner stability control, speed sensing auto door locks, dual front airbags and energy absorbing front crumple zoneIn terms of the braking, the Tata Tiago comes with disc brakes on the front wheels and drum units at the rear and this fitting is standard across all the variants. However, only the top-end variants – XZ (both petrol and diesel) and XZA, get the addition of ABS along with EBD and corner stability control. Moreover, dual airbags are added as a standard feature across all the variants, including the base XB trims. The Tata Tiago is a reasonable and affordable hatchback in the Indian automotive market by the carmaker. The car comes in eight Revotron (petrol) and eight revotorq (diesel) variants. The variants are Tiago Revotron XB, XE, XE(O), XM, XM (O), XT, XT (O), XZ and Revotorq XB, XE, XE(O), XM, XM (O), XT, XT (O), XZ. The Tata Tiago comes with a 1199 cc petrol engine and a 1047 cc diesel engine with a five speed manual transmission. In terms of safety, it comes with disc brakes in front with drum brakes at rear, ABS, EBD, corner stability control, speed sensing auto door locks. Key features include body coloured bumpers, power steering, integrated spoiler with spats, multi drive modes and music system with USB, AUX and Bluetooth.